You should probably check out that big red box over there (or down there, on mobile). 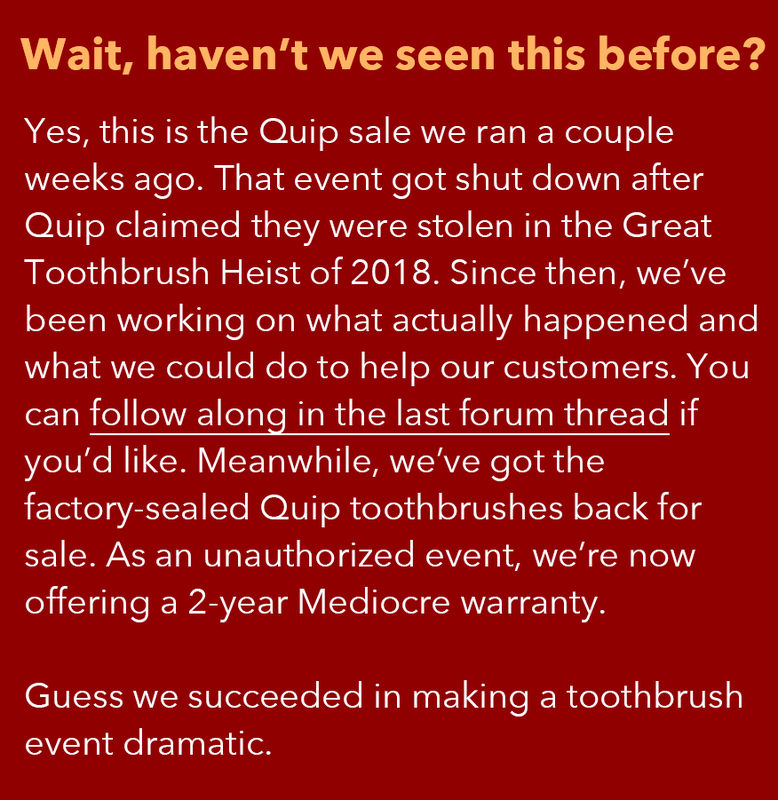 Support Quip and don’t buy these or don’t support them and buy them - we don’t know what to recommend anymore. It has a built-in timer. Like, for how long you should brush certain areas, not for cooking a roast. It’s small size and lightweight design make it a good toothbrush. Quip also wants you to know it’s waterproof, which seems like maybe it should be a given? The travel cover doubles as a stand and mirror mount… which is actually pretty neat. It has been accepted by the American Dental Association. What it will learn there, among the allusive dentists is anyone’s guess. Cool: The Quip is cool because it looks cool. Whether you opt for a plastic or metal version, you’re sure to get a stylish, sleek product that’s way more compact and manageable than many other electric toothbrushes. Uncool: It is a toothbrush. Cool: Even if you have one of those aforementioned bulkier electric toothbrushes, you could still get a Quip. That’s another cool thing about it: its size and weight makes it a great option for someone who wants an easy travel toothbrush but doesn’t want to give up all that their Sonicare has to offer. Cool: Perhaps the coolest thing about Quip is that they make everything super easy for you, and not just in their toothbrush’s features and design. They also offer a very cool subscription service, wherein you sign up and then every 3 months they charge you $5 and send you a new brush head. Because, c’mon, who among us has not gone a little too long with a brush that looks like a frayed and tattered old broom? Verdict: Quip tries really hard to make these things pretty cool, but in the end, they are toothbrushes. Deal ended 1/30/2019 12am ET .